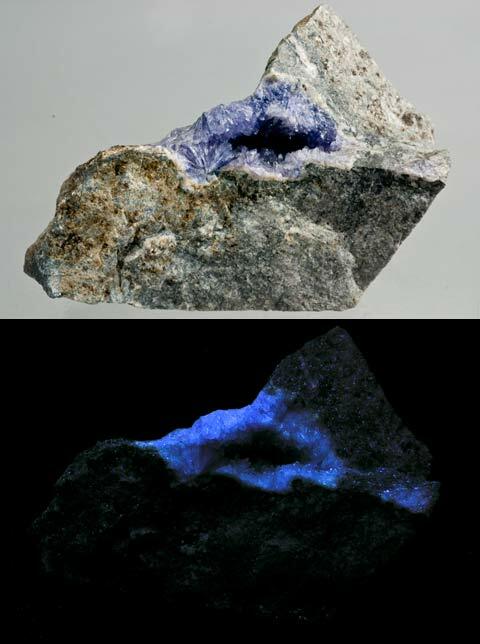 A pair of blue-fluorescing sphalerites (called cleiophane by collectors) from the Franklin mine (the photo on the left was taken under SW UV, the one on the right was taken under LW). 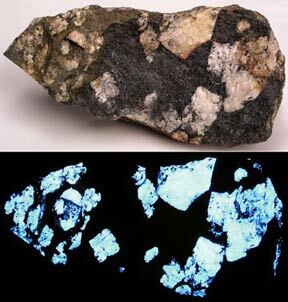 Most sphalerites fluoresce a soft orange LW and occasionally SW, but the occasional piece fluoresces blue and orange SW & LW and where the two colors overlap, it looks pink. These are really striking colors in person. 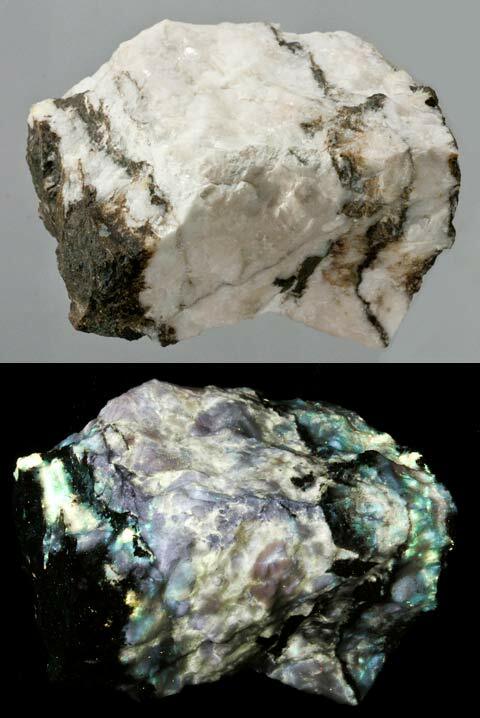 The piece on the left has a pinkish color in daylight which is a clue that it might be a sphalerite-bearing stone. The piece on the right has really superb color. This shows a good reason to have both a SW and LW UV lamp. This is from the Sterling Hill mine with two veins of sphalerite running through it. Under SW the sphalerite barely fluoresces and shows up as a dark vein. 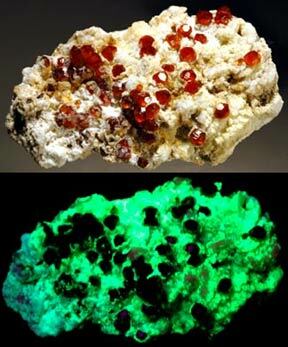 The willemite fluoresces green SW. 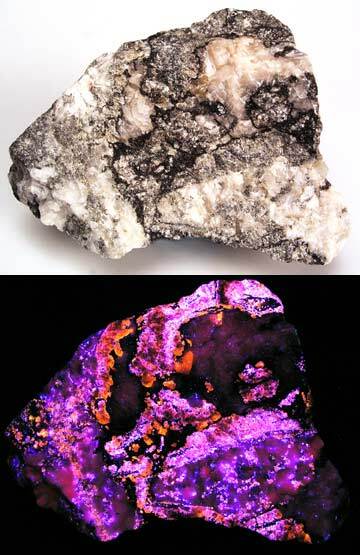 Under LW, the sphalerite jumps out as fluorescing orange veins. A rare golden sphalerite with franklinite from the Franklin Mine, Franklin, NJ. 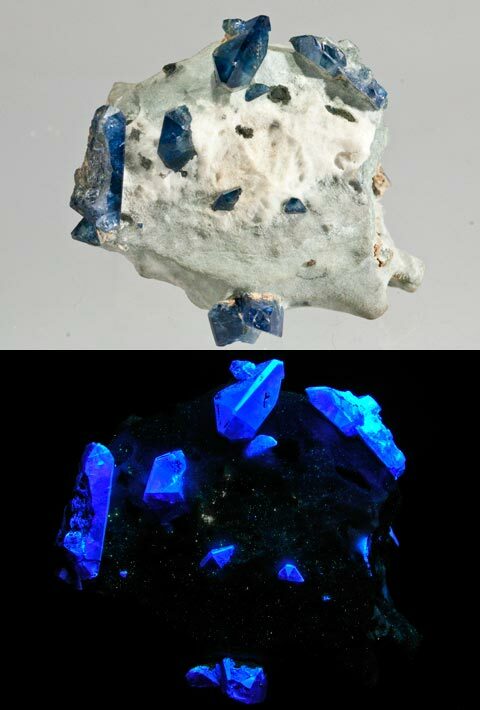 The sphalerite fluoresces gold with blue highlights LW and pink & blue SW.
Benitoite from the Benitoite Gem mine, San Benito County, California. 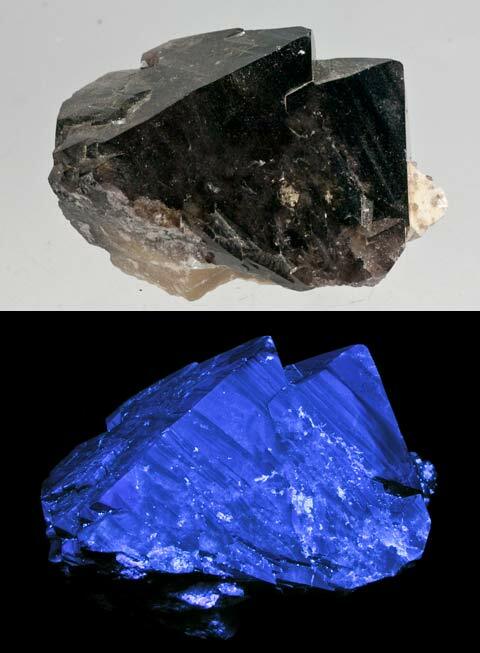 Benitoite fluoresces blue SW. Benitoite is only found in San Benito County and is, in its best form, a precious gem that can be faceted and worn in a pendant or ring. Scheelite from the Hollinger mine, Timmins, Ontario, Canada. Scheelite fluoresces bright pale blue SW. Connecticut was also a great source for a similar looking scheelite. Scheelite crystals on matrix from Traveresella, Italy. 12.5 oz. and is 4.0 x 2.0 x 2.0 inches. Scheelite from Xuebao Ding Ping Wu, Sichaun Province, China, which has a very atheistically pleasing setting of large crystals of scheelite embedded in muscovite. An incredibly fine example of rare black scheelite from the Yaogangxian tungsten mine, Hunan Province, China. This scheelite's surface appears like glassy obsidian. 6.5 oz. and is 2.3 x 1.8 x 1.5 inches. 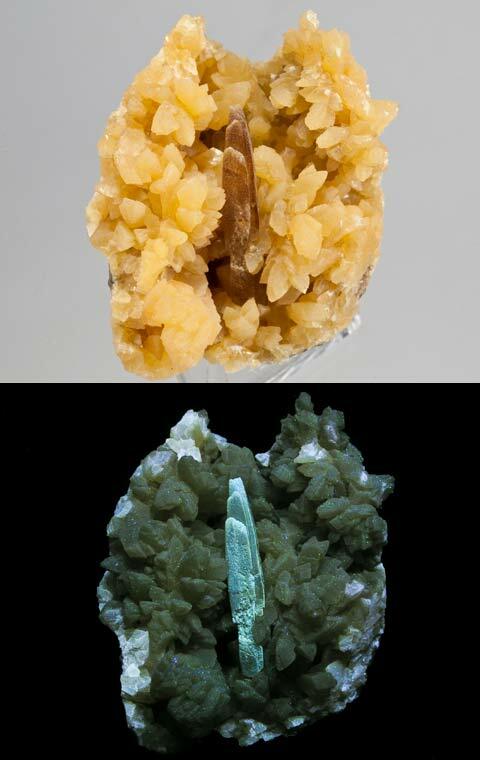 A scheelite crystal on dolomite from Baia Sprie, Maramures County, Romania. 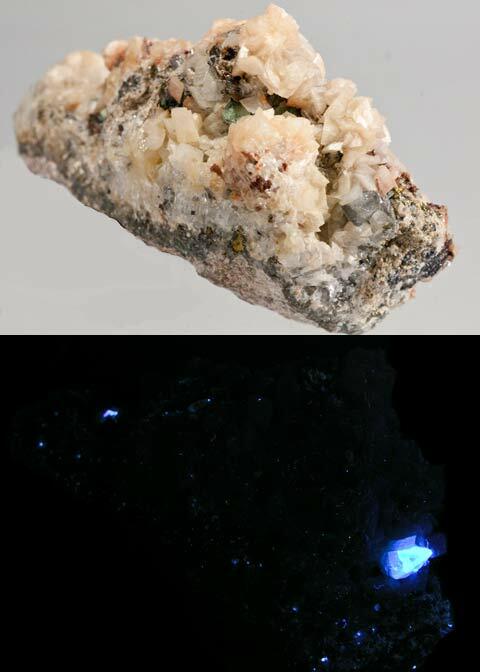 Fluorescent creedite crystals from the Hall mine, San Antone District, Nye County, Nevada. 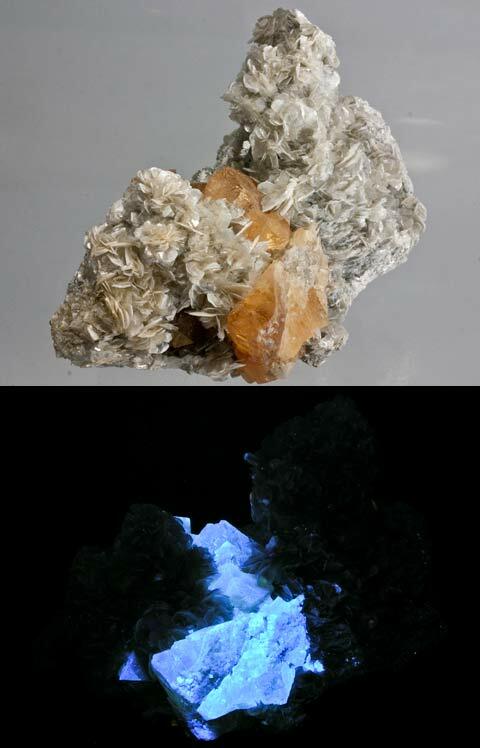 The creedite fluoresces smoky white SW, pale peach LW and phosphoresce pale blue. It weighs 5.0 oz. and is 2.6 x 2.5 x 1.3 inches. 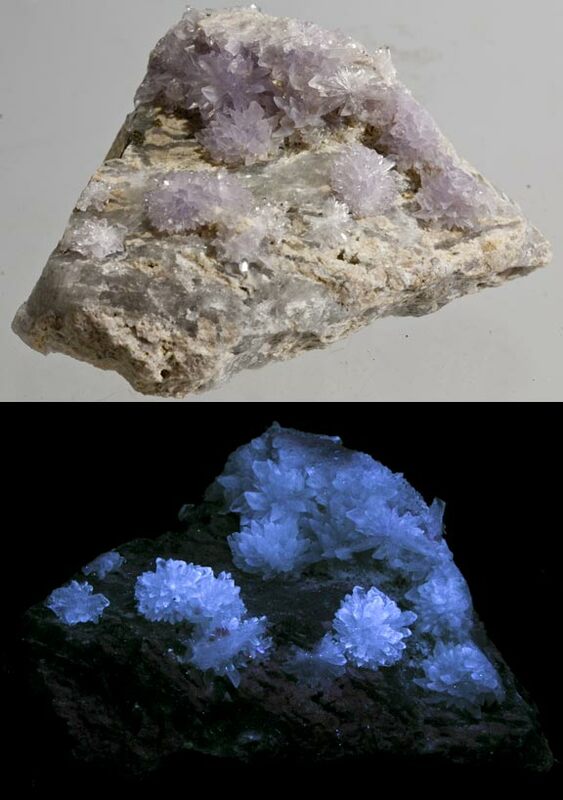 Violet creedite crystals from Cresson mine, Cripple Creek, Teller County, Colorado. Creedite was first described in 1916 from the Creed Quadrangle in Mineral County, Colorado. 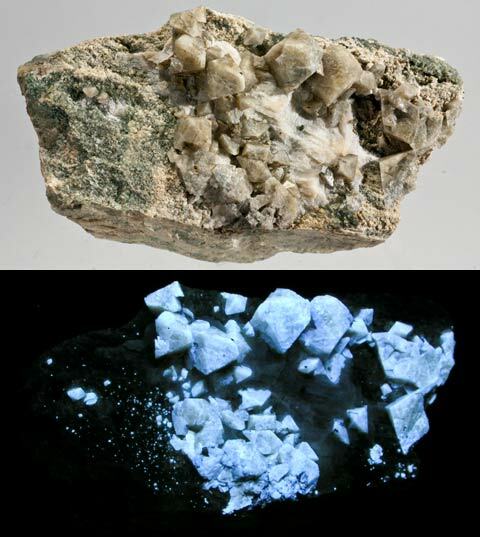 The crystals fluoresce strong pale blue SW.
Datolite from the Dry Creek area, Healdsburg, Sonoma County, California. 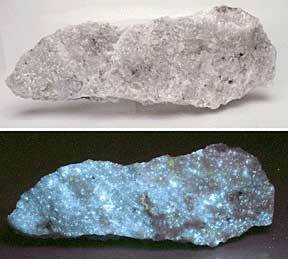 Datolite fluoresces yellow and creamy yellow SW. Datolite is sometimes called the esperite of the West. 14.0 oz, 3.5 x 3.0 x 2.0 inches. 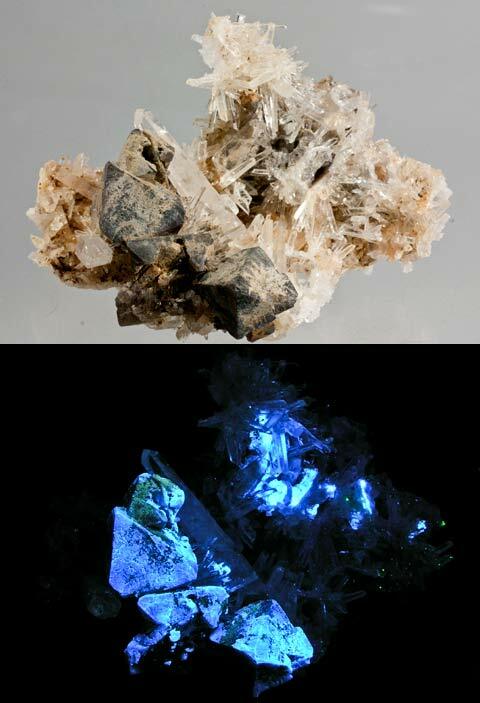 From the outside layer to the bottom, there is a golden barite crystal (fluoresces pale blue SW) in the center surrounded by a bed of calcite crystals all atop a SW white-fluorescing calcite. The piece is from Elk Mountain, Mead County, South Dakota. 3.0 oz. and 2.5 inches wide. 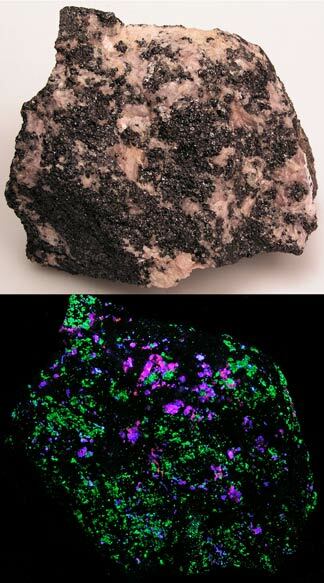 Arizona probably places third in nice fluorescent minerals after New Jersey and Quebec, Canada. This piece contains fluorite, calcite, and willemite from the Hogen Mine, Wickenburg, Arizona. 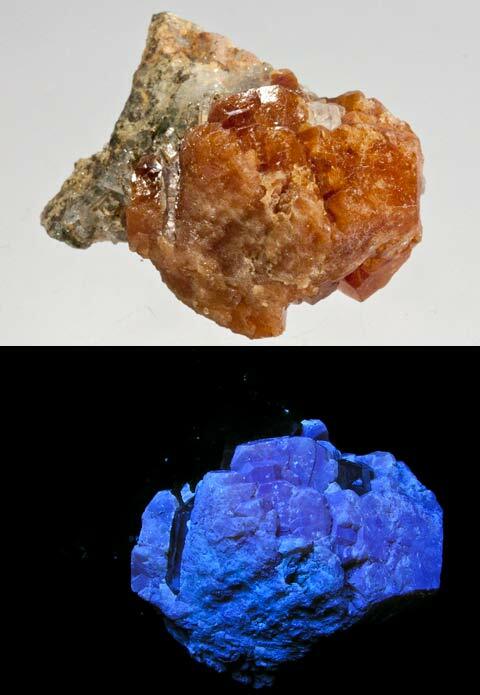 Fluorite fluoresces violet LW & SW, calcite fluoresces orange SW, willemite fluoresces green SW.
Diopside and phlogopite from Pierrepont, New York. 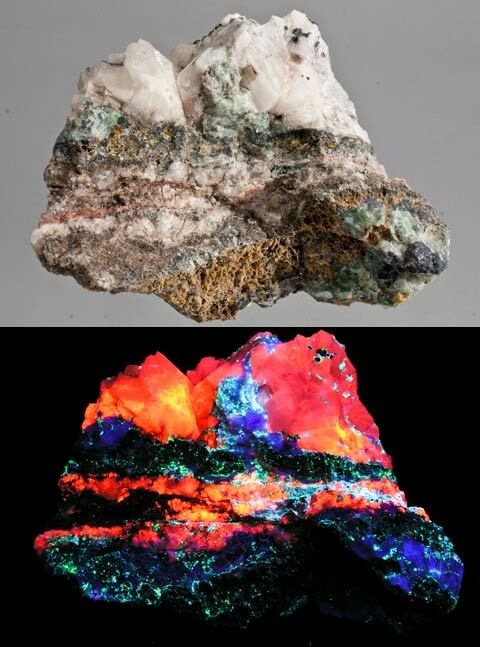 Diopside fluoresces bright pale blue SW, phlogopite fluoresces yellow-orange SW.